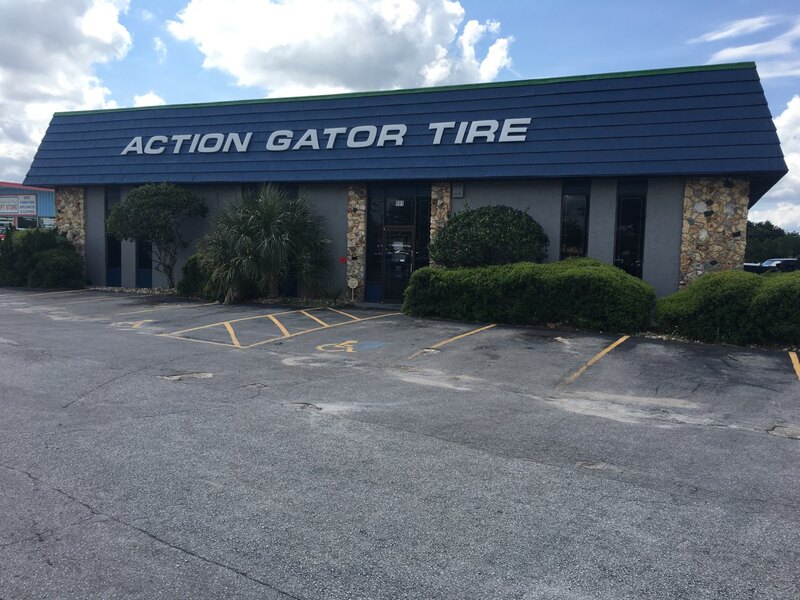 Our Action Gator Tire location at 591 East Highway 50 in Clermont, Florida is positioned very conveniently to Mascotte, Groveland, Minneola, Montverde, Oakland, and the Clermont area. 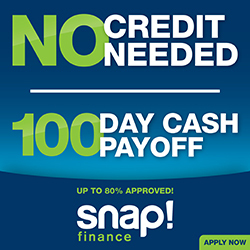 Find detailed driving directions to this store below. If you’re in Minneola or north along the Highway 27 corridor, take Highway 27 south to the interchange with FL-50. Use the right lane to take the ramp to FL-50, and turn right onto FL-40 West toward Clermont. Action Gator Tire is the blue and yellow building located on your left about 0.3 of a mile from the Highway 27 and FL-50 interchange, across the street from the Winn Dixie shopping center. You’ll see our large Goodyear tires logo as you approach from this direction. If you’re in Tildenville, take Avalon Road north toward West Colonial Drive (FL-50). Turn left onto FL-50 at the intersection with the Shell gas station (Circle K) on your right. Continue on FL-50 for about 8.6 miles. You’ll cross under Florida’s Turnpike, past John’s Lake on your left, past the Lowe’s Home Improvement on your left, and then under the Highway 27 interchange. Action Gator Tire is the blue and yellow building located on your left about 0.3 of a mile from the Highway 27 interchange, across the street from the Winn Dixie shopping center. You’ll see our large Goodyear tires logo as you approach from this direction. If you’re in the Polk City area, take FL-33 north toward Groveland. After about 10.9 miles, turn right onto County Road 561 (two turns after the Green Swamp Country Store (Sunoco) on your right). Continue on County Road 561 for about 5.2 miles, past the Diamond G Adventure Ranch on your right and Pine Ridge Elementary School on your left, then across the Palatlakaha Creek bridge. Turn left onto 12th Street, following the sign for Highway 561 North. Continue for 0.4 of a mile before turning right onto FL-50 East. Continue east on FL-50 for about 1.7 miles, passing Center Lake on your left, Auto Zone on your left, and then Lake Sunnyside on your right. Action Gator Tire is the yellow and blue building on your right, just across the street from the KFC and the Winn Dixie shopping center. If you’re in Groveland, take FL-50 east toward Clermont. Continue about 6.5 miles from the middle of Groveland, passing Center Lake on your left, Auto Zone on your left, and then Lake Sunnyside on your right. Action Gator Tire is the yellow and blue building on your right, just across the street from the KFC and the Winn Dixie shopping center. I love Action Gator Tire.! My struts and shocks were gone as were my front brake pads. The car .had to be fixed . A friend told me they were the best place to go and he was right.Not only were they kind and understandingthey fixed everything and gave me the very best price! Sherwin and the whole team were wonderful! I will always go only to Action Gator Shop Clermont. My car runs so much better! Judy T.
BEST all around! Thank you Action Gator Tires of Clermont for always having unbeatable prices and top notch customer service. Highly recommend. Went in for an oil change and tire rotation, but they noticed my tires were no longer safe. They did everything right away. They did a break job for me a couple weeks back, the breaks we're squeaking because of defective pads, I brought it in over 10 days later they replaced the defective pads and my rotors at their own expense. This is the type of service that brings people back. Thank you! They are the best place in town to take your car to get an oil change or get a repair. I have never had a problem. They are very honest and very well priced! Great staff and fast service. Knowledgeable employees and caring attitude! Thanks Greg Sherwin. Awesome service! Sherwin was so knowledgeable and helpful. Great experience. The service there was great. I would definitely be going back again. Thanks mark! Thank you Matt at Action Gator Tire in Clermont! Two weeks ago I stopped by there and he topped off all of my tires. A few days ago I got a warning that one of them was low again so I stopped back by to have it filled. He looked at my tire and did not see anything but asked if I had a minute so he could take it off and check it properly. Sure enough he found a nail in. He patched it and I was safely back on the road in just a few minutes. I am on the road all day for business. I greatly appreciate your concern for customers safety! Thank you again! Service is the best! Very friendly staff and wait times are not long. Sherwin has taken care of my car twice now and always has a smile on his face and is willing to help! Definitely recommend them for any issues with your tires and oil changes ! Service done quickly at a good price. Pleasant, clean waiting area. I would definitely recommend Action Gator tire for routine auto maintenance. Had my Toyota Tacoma towed in for a running rough and stalling issue that I've chanced for weeks and couldnt figure out. Action gator had it for 2 hours and knew what it would take to fix my truck. Got it back and runs perfectly and for a fair price. I would definitely recommend other to come to action gator for their vehicle needs!!! Been going here for the last 10 years. Great service, great people, great prices. I recently had the rear brakes and drums replaced and the air conditioning checked out. A couple days later my battery died and after it was replaced, the car still wouldn't start. They ended up replacing the starter at a very very discounted rate. I appreciate everything these guys do for me. They really care and that's why they're the best. Choose this place! I always get great service! They quickly orders the tires I requested, and are always quick to help when any problems arise, refilling air, plugging a hole where there was a nail or rotating tires. Great service, it’s the only place in town I recommend people to go to! I came into town with my family when our mini van's low tire light came on. In a panic, we pulled into Action Gator and Tooly and Brandon treated us so well. Their waiting area was clean and they even had an area to entertain our grandson.They showed us were the tire had 2 (TWO) nails! They tested us fairly and we were out off there in no time. Thanks for getting us back on the road guys! I had an appointment at Pep Boys and when I got there they said that even with the appointment I was going to have to wait for 2 hours. So, I left and called Tire Kingdom and they said it was going to take 3 hours. I decided to head home, but noticed Action Gator Tire and took a chance there. Even though they were serving several clients, I didn't wait more than 5 minutes for them to take my car and I left 20 minutes later with my car fixed!!! I am not going to go to those big chain car shops anymore, I highly recommend Action Gator Tire, Tooly was awesome, great customer service! bought 4 good tires there last autumn...competitive prices! Saturday late afternoon customer...no grief given, even though to install them took the staff right up to their closing time. more recently hit a screw...slow leak....patched and out of there in 15 minutes!Tires themselves are good, prices good, service even better! Great Customer Service, best prices compared to other tire shops within the vicinity of Clermont. Highly recommend Action Gator Tires. These guys take care of customers. I had a tire that needed a patch. They took care of it quickly and didn't charge me. This is the second time this has happened and it was completely unexpected. I highly recommend them and will not use anyone else for tires and service. 5 stars all the way! This is a 5 star place. I have been there to get my flats fixed my oil changed and tune ups for all my vehicles! They are always very friendly and courteous and always great prices! Would highly recommend this place to my friends and family! Great experience. Being new to Clermont I wasn't sure where to take my vehicle. I can cross finding a reputable and reliable auto repair shop off the list. Tooly and his crew were great. Very courteous and knowledgeable. Just a small repair this time but I will be sure to bring my vehicle to them whenever it needs service. Very clean office and nice waiting room. All around a great shop. Very friendly staff and they actually provided the service expected and nothing more. Went in for an oil change, walked across the street for some brunch and car was ready when I came back. Tooly was exceptional in his assistance and customer service. Thank you! I will be returning again. Great experience at Action Gator Tire. Had trouble getting my lug nuts off to get the tire patched and Action Gator Tire handled it all with professionalism and kindness. Took the truck to two other places that said they couldn’t help. Should have known better and gone to Action Gator Tire first. They had the tire off and patched in no time. Great service and kind helpful staff. Five stars for sure. I won’t be going anywhere else! If you need anything tire related...don’t go anywhere else! Tooly is amazing and took such amazing care of us. I came in for a patch and he didn’t try to sell me anything or tell me I need 4 new tires. They were fast and very friendly! They didn’t even charge me to fix my tire. There truly are still good people and businesses left! Thank you Tooly! These guys were a life saver today! I hit a pot hole this morning and got a flat tire. They got me in and out with only a patch thank goodness!! Super friendly and helpful! Thanks Tooly and Brandon!! Went in last minute to get my tire patched and worked around their busy schedule to make sure I was out in a hurry. Will definitely come back next time my car needs work done. Totally satisfied with the service & attention to detail, that I got from customer service agent Tooly, in getting my tire fixed. I will definitely be a repeat customer. Tooly was amazing and so is everyone there. Came in to get my tire looked at that was loosing air, after being told by Walmart that I needed a brand new tire that they couldn’t fix it. Walmart was going to charge me over $200 for a brand new tire. So I went to Action Gator the next day and Tooly walked me through everything. Checked my tire for free, and found out they could fix the tire because it had a nail in it. This saved me time and money and I’m glad they took care of me. I highly recommend this place. It’s the best and my mother recommended this place to me because hey always take care of their customers. DONT GO TO WALMART! Tooly you deserve a raise. I'm new to the area, and had a nail in my tire. They were very nice and plugged it up quickly without an appointment! Great job! Agent Tooli took really good care of us. Quick, friendly, and excellent service. Thank you for your great service!!! Went there today. The gentlemen there was very helpful. Had me back on the road in no time.Will definitely return in the future. Awesome, honest, fast, service. Extremely fast too. Would highly recommend them to everyone. These folks are quite simply the most attentive and accommodating people. They take care of your car understanding that this is your pride and joy. I heartily recommend them and their service. Charles is Awesome!!!!!! He went above and beyond to help us with an issue we had with a newly financed suv and its warranty. After going to pep boys being told there was nothing wrong, we went to Action Gator Tires for a second opinion and couldnt be more thankful we did. Turns out there was a seperated tire and bent rim. He was able to get us TWO new tires and a new rim covered by the warranty. Great customer service!!!!! We will highly recommend AGT because of Charles. Thanks a million!!!! I bought my car to the store with a slow leak in my tire.the waiting took 20 minutes. Best service I ever received. Thank you action ture in Clermont fl. Been bringing my car is to the shop for years. Staff knows what they're doing. Even when they are extremely busy they take the time to check what's going on with your car and they always do it with a smile on their face to boot. I just moved to the area and needed a tire fixed. Came here and was impressed with the level of customer service. They definitely went above and beyond my expectations. Will highly recommend! These guys won me over years ago when I first moved to the area. They go out of their way to get things done. I still take my car here even though I have to wait a little longer for my oil changes because of the customer service and fair pricing. I like supporting local business and honest work. Thanks again Pete, Charles, Steve and the rest of the staff for taking great care of me and my car! Have always gotten great service here. Will definitely be back. I had a flat tire in the rain on I4! But Tpms helped me save tire and rim by putting on the spare. . Saturday morning I got it patched st Action Gator. Great customer service and even when busy they will fit you in. Great quick, no pressure service. I went in explained I know I need tires but it's Christmas so just an oil change please. No hassles and I appreciate that!